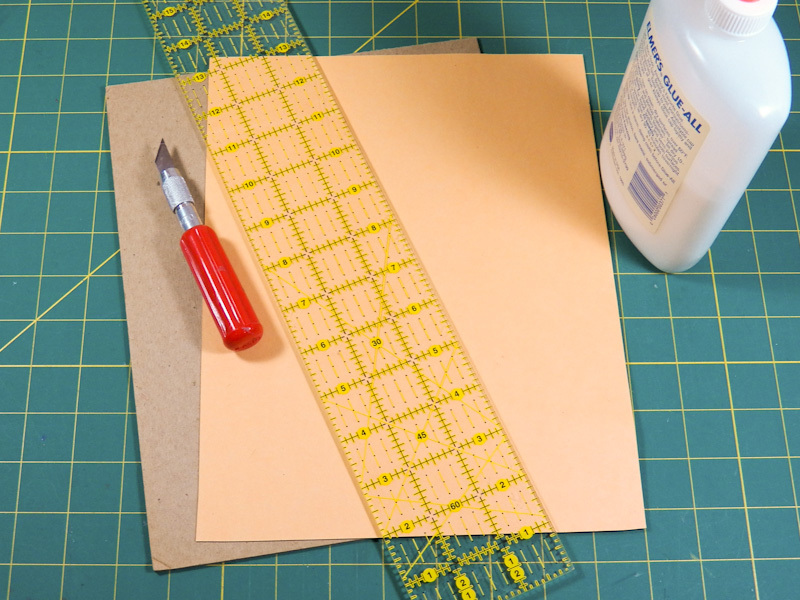 It's easy to make crisp and accurate fold lines with a scoring board, but there's no need to buy one when it's so easy to make one yourself! In this project, see how to make your own custom scoring board that can also be used to add embossed lines to your handmade cards and scrapbook layouts. You can also use the scoring board to make score lines for your handmade boxes and in other paper crafts. Tip: Custom scoring boards are particularly useful in crafts that require many scores, like the accordion folds for paper rosettes. Gather the materials and tools needed to make the scoring board. 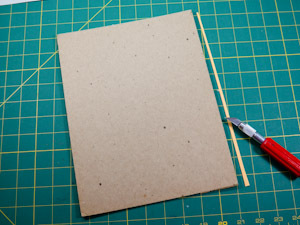 The board is composed of a heavy cardboard base with a poster board top. For card making the board should be 8½" by 11" or larger, but make the board any size you like. Cut the cardboard for the base to your desired board size. Cut a piece of poster board the same size. Tip: The cardboard from the back of a paper tablet works well as the base of the scoring board and doesn't need to be cut down. 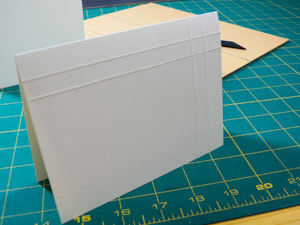 The scoring grooves are made by gluing slightly spaced strips of poster board to the board's base. 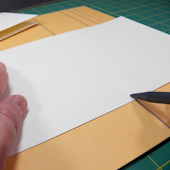 For card making, it is handy if the first groove is located 4¼" (105 mm) from the left edge. That makes it easy to score the fold line for a greeting card cut from letter-size (A4) cardstock. 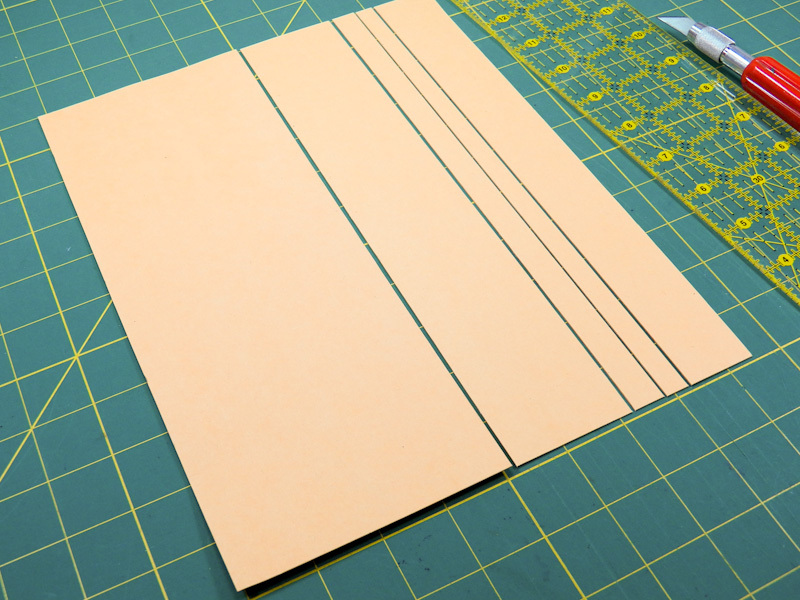 To do this, cut the first strip from the poster board just shy of 4¼" wide, by 1/32" or so. 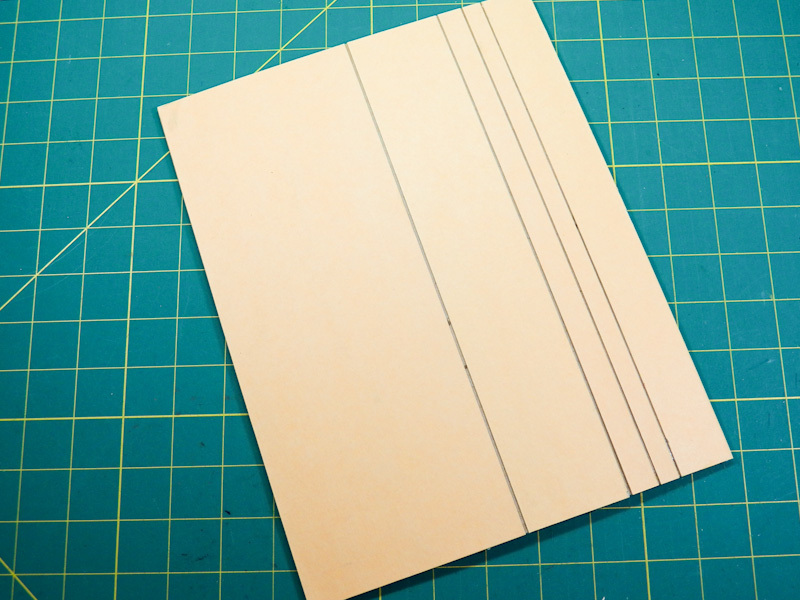 If you want more scoring grooves, determine the number and spacing, and then cut more strips from the poster board. 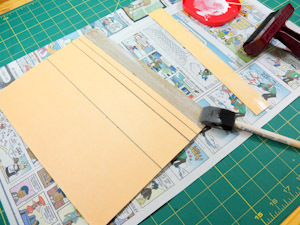 In the illustration, the right half of the poster board is cut into 4 additional strips—2", 1/2" and 3/8" wide with the fourth being the remainder. Use a good quality of white craft glue (Elmer's or PVA) to glue the poster board strips to the base cardboard. Use a foam brush to apply a thin coating of glue to both the base cardboard and the poster board. Align the left strip with the edge of the base then glue the other strips to the board, leaving a 1/16" gap between strips. The last strip will extend beyond the right edge of the board. Tip: Be sure the poster board strips are firmly adhered to the base by running your fingers, with pressure, along the edge of each strip. Running a brayer or wallpaper seam roller over the surface several times is very effective! Flip the board over and trim the excess poster board from the right edge of the scoring board. Place heavy books or other weights on top of the board as the glue dries. Once the glue is dry your scoring board is ready to use. To score the center fold for a card, align the card to the left edge of the board and draw a blunt tip (scoring tool, bone folder, empty ball pint pen) down the groove using light pressure. You can also use the grooves in the scoring board to make embossed lines. 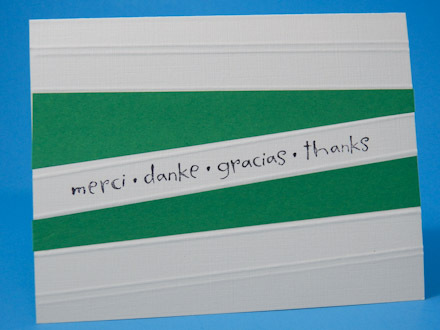 This card has horizontal and vertical embossed lines. 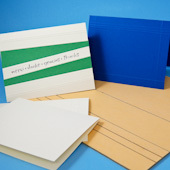 Tip: The groove pairs on the example board are spaced 1/2" and 3/8" apart to aid in making double embossed lines. Custom scoring boards are particularly useful in crafts that require many scores, like the accordion folds for paper rosettes. 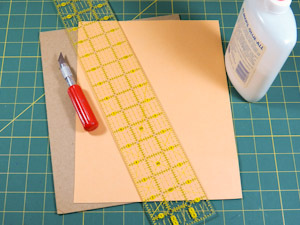 Make a paper rosette scoring board with grooves 1/4" to 1/2" apart. A small board, like this 4" by 6" one, works well. That's it! Your scoring and embossing board is done! 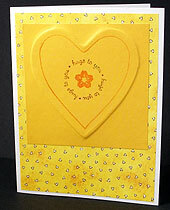 Related craft: For more on embossing and another embossing tool, see the Embossed Cards tutorial. 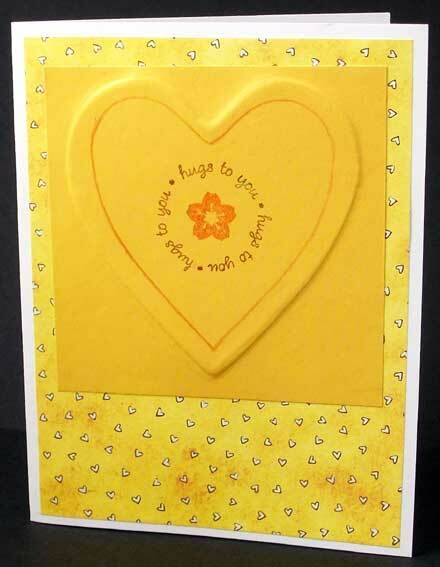 Tip: Use the board in your card making to aid in folding cards and to make embossed accent lines. Tip: It's easy to make paper rosettes with a scoring board. Just mark the fold lines for the accordion folds and score each line over a groove on the scoring board. It's easy to mark the fold lines with one of the scoring line templates. 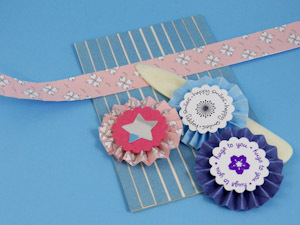 This rosette was made from the star ribbon on Aunt Annie's Circus Paper Ribbon ePaper. 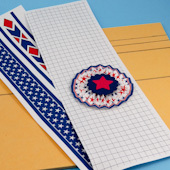 Tip: As an aid in making paper rosettes, print the Quarter-inch scoring lines template or 7 mm scoring lines template on the back of a sheet of decorative paper. Cut 1" to 2" wide strips the length of the paper and score the lines on the back of the strip using the scoring board. 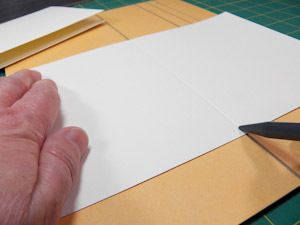 Accordion-fold the strips, glue the ends together to form a ring, squish the ring flat and glue the center with white glue and paper disk or a glue gun. Tip: Use embossed lines to make an elegant thank you card.